How does the weather affect my solar production? How do the seasons and weather affect my solar production? 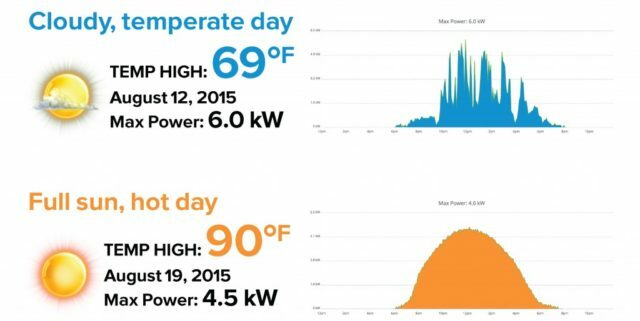 Solar panels do produce better at cooler temperatures! Hot, hot heat is hard on electronics in the summer, so the cooler days and months provide more efficient solar production. So, those hot blue sky summer days? Your solar system will be cranking, but you won’t see it performing at its max power level. For example: A 6 KW system can produce a max 6 KW at any given time. But, in the hot, hot days of summer the system will peak at a lower max power level because the heat reduces the panel efficiency. Alternatively, on cooler days you’ll see higher max power levels. And in the shoulder seasons (spring and early winter) you’ll see some of your most efficient days reaching max power, but given the days are shorter with less sunlight you likely won’t see bigger solar production numbers. No need to worry! We’ve sized your system by calculating year-round solar production so that you can count on your over-production during the long, summer days helping carry you through the shorter, darker days of winter. This is thanks to our ability to net meter with the utility companies! Even with all this information about solar, you may be wondering how does solar work? I thought it was too cloudy in Vermont to have solar panels? Do I still pay a utility bill? The basics of solar are relatively simple. We’re here to help. Find out how solar works by clicking below.